That we sentence 1.2 million Jews to die of hunger should be noted only marginally. 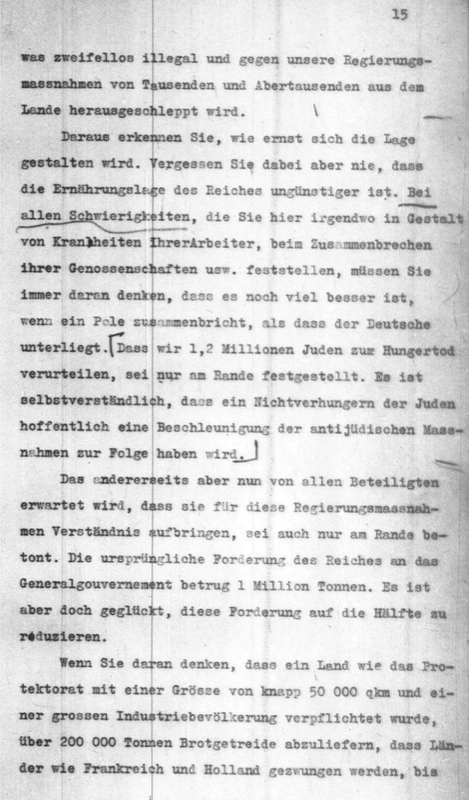 It is a matter, of course, that should the Jews not starve to death it would, we hope, result in a speeding up of anti-Jewish measures [2233-E-PS, Nazi Conspiracy and Aggression Volume IV, p.900]. Figure 1: Regierungssitzung, 24.8.42, p.15, Vol. 24; Regierungssitzungen From 11 March-9 December 1942; And Hauptabteilungsleitersitzungen (Main Section Leaders' Meetings) From 13 April-8 December 1942. Record Group 238: National Archives Collection of World War II War Crimes Records, Diary of Hans Frank, 1939-1945. National Archives (U.S.). Archives Unbound. Web. 6 Feb. 2017. Frank not only revealed a "death sentence" but also admitted that a death sentence was already being carried out, namely the "anti-Jewish measures" that he wanted to be "speeded up."